Choosing a metal for an engagement ring is nearly as important as choosing the gemstone that will grace it. 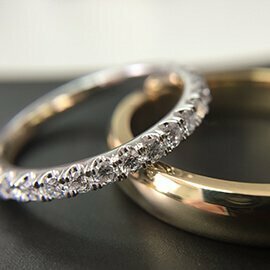 This is because the metal is what comes in contact with the skin, and as it will make up the band of the engagement ring, it’s going to be worn just about every day. Because of this, comfort and durability are important factors, as is price. 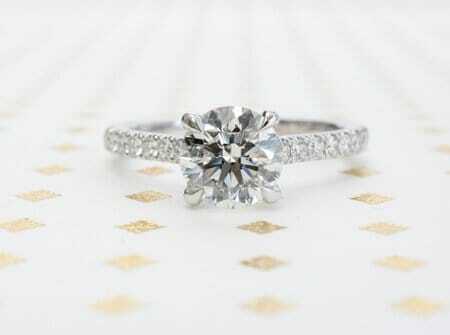 Two of the most popular metals for engagement rings are gold and platinum? Which one is better? To be honest, neither one of them is “better.” Both are beautiful metals and have benefits that far outweigh their drawbacks. Here’s a comparison between platinum and gold when it comes to engagement rings. Platinum is a shiny, silver-white metal. It is considered a precious metal like gold and silver but is also considered a noble metal because it doesn’t easily combine with other elements. It doesn’t tarnish or change color over time, and its sheen brings out the best in a white diamond. Platinum is tough and durable. Many platinum rings are 95 percent platinum, with the other alloys being metals such as the closely related palladium, ruthenium or iridium. Platinum is hypoallergenic, so the wearer doesn’t have to be worried about an allergic reaction while wearing it. Over time it might accumulate tiny scratches just from being worn. These scratches can simply be buffed away with a cloth. On the other hand, platinum is 15 times more rare than gold. It is usually more expensive because it is so sought after as a material for jewellery and industry. There are times when an ounce of platinum has been over $1000 more expensive than an ounce of gold. At other times platinum has been less expensive than gold. For example, by the end of February 2018, gold sold for $1333 per ounce, while platinum sold for $987.30. Even as it is not so rare or strong as platinum, gold has a special place in the human imagination. It’s been made not only into jewellery, but money. It’s used in both art and industry. There have been gold rushes and gold standards and gold panics. Alchemists tried to turn lead and other base metals into gold. Gold lures people in with its bright yellow color, which is rare for a metal. This color never tarnishes. King Tut’s death mask and doubloons brought up from wrecks that have been in the ocean for centuries are as shiny as they were when they were first made. Gold’s one problem is that pure gold, or 24 karat gold is too soft to wear every day. This means it has to be alloyed with other metals such as copper, nickel or zinc. Happily, this results in different coloured gold. Add a bit of copper to pure gold, and it produces yellow gold. More copper produces rose gold, while zinc and nickel makes white gold, which resembles platinum but usually isn’t as pricey. These alloys also make a gold engagement ring tough enough for every day wear.